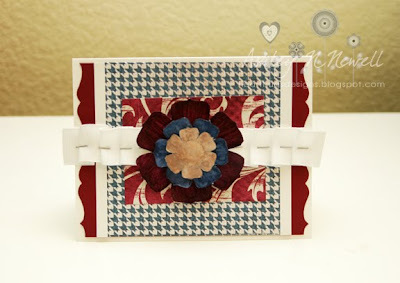 AshleyNewell.me: Creative Inspirations Blog Hop!!! Wow! It's the FIRST ever Creative Inspirations Paint blog hop! YAY! You should have arrived here from Barbara's blog, if not please head back to the Creative Inspirations blog to start the hop. Go all the way through, collect the letters and then go back to the Creative Inspirations blog to leave a comment with your clue. Then you'll be entered to win a FABULOUS prize! Here's my card using 3 of the 4 LIMITED EDITION paints that are being released for the Creative Inspirations Paint anniversary. I used Burgundy, Denim, and Beige on my flowers. Sorry, I tried to take another picture to show the shimmer but my camera died. The DP is Pink Paislee and the ribbon is from Michael's. I added some Liquid Glass to center of the flower, not sure if you can see it. I used one of the Verve anniversary sketched for this card. Ok, next please hop over to Gerrie's blog to continue the hop! Ashley this is so pretty. Love how your flower. Beautiful card. That flower is awesome. Love the pretty flower! Beautiful card! Thank you for sharing your beautiful card. I really like this card! I love the layered flower! Awesome flower! Your card is very pretty! It's fun to learn the versatility of these paints! Beautiful artwork! Lovley card, wonderful use of the paints on your flower medallion. This is so nice, love the flower. This has been a fun hop! Very pretty GF, the Burgendy really stands out nicely on this. Great card. I would love to win so I can begin to use these paints. They add so much. What rich colors in your beautiful card! You've done an amazing job. Very pretty girl! I need to try those paints out! What a fun hop! What a pretty layered bloom. Pretty flower! Love these new CI colours!! Wonderful card Ashley, you really were able to make the colors stand out. Wow! These colors have so much depth! Beautiful. I really love the denim and the beige!